While operating, how does a brain surgeon know exactly where to find a tumor? 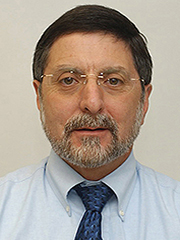 Frank J. Bova, professor of Neurosurgery works in surgical guidance. His first efforts, in collaboration with William Friedman, resulted in the first commercially available system for linear accelerator based radiosurgery, and the first such system to be cleared by the FDA for routine clinical use within the United States. It has since become the most widely sold radiosurgery system in the world. And over the past five years, Bova has improved and developed his approach to radiosurgery. His work includes developing a system, including infrared tracking cameras, to provide high-precision radiotherapy treatments. This system has now been patented, licensed, FDA cleared and installed in nearly 100 clinics around the world. To extend imaging beyond the brain, Bova helped develop a system based on 3D ultrasound, also cleared by the FDA. “An NIH sponsored clinical trial has just been completed documenting the clinical efficiency of this system against the previous state-of-the-art approach to treatment for prostate cancer,” says Bova. Over the past three years, Bova has worked to simplify both equipment and processes used in image-guided neurosurgery, a complex and very expensive field, and continues to evaluate possible new technologies in image guidance. “On a daily basis, patients with brain tumors and brain vascular malformations are cured as a result of his work,” says William A. Friedman, chairman of the Department of Neurosurgery.